I wanted to start a short series of posts, describing my experience in building simple Windows 8 Metro application using XAML, C#, and a service in Azure. The application is very simple, it is a going to be a famous quote app, where the user can get an on demand random famous quote. I am going to use a web service to generate an application. On top of that, I am going to add a live tile to my Metro app that will periodically refresh with a new quote. I will at the end publish all source code as well. One note is that you can easily substitute Azure for your own hosting provider. You can check out my previous blogs on that subject. With the main premise out of the way, let’s get started. I am going to login to my Azure portal, sign in and create new database. I would like to support authentication, not wanting to make my service visible to whole internet unprotected, so I am going to add two tables: users and quotes. I know this could be cleaned up, but I am not concerned about that right this minute. Then I use QCF service template. 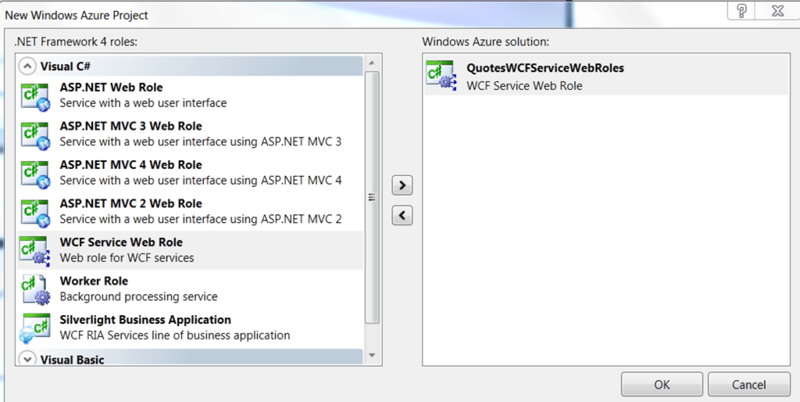 Now click OK to create base project along with standard WCF project. The WCF template is pretty standard. I am going to clean it up and create two methods I am going to need – one to generate a quote, one to create a tile output. Now, I am going to create my EF classes. Since I have local copy of the same database, I am going to use Power Tools to reverse engineer my EF classes. I am not going to concentrate on that task, it is pretty basic and just reflects table structure you saw above. Please easy so far. The implementation is just as trivial. 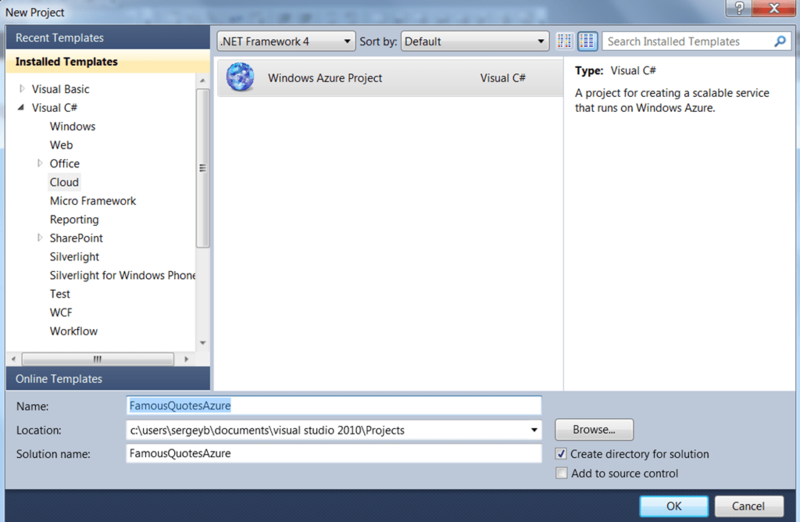 Now I need to publish to Azure. I found a long time ago that the easiest way is to do that through Visual Studio Publish wizard instead of manually uploading package. Just right click on Azure project, select publish and follow instructions. You will have to sign in to your Azure account and download publish profile in the process, then import that profile in the wizard. You may have to repeat the process if you get certificate error as initial run has to setup the certificate and storage account used for deployments. Everything worked great. In the next post I will demonstrate how to secure the service and test that part through a small test hardness.